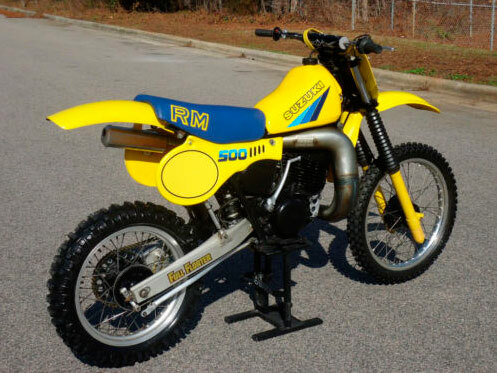 We are excited to offer this exceptional and very rare 1983 Suzuki RM500 AHRMA Post Vintage MX bike. Any vintage RM is getting tough to find – not to mention the rare 500! Full frame off restoration. New plastic. Tank refinished. New seat cover. New bars / levers / perches / grips. New gold series chain. New DG pipe and silencer. New backgrounds and decals. The bike runs super and shifts well – tight low hours example! This is a chance to own a piece of MX history affordably. This is a very nice example that you could be very proud of at any vintage race. The reserve is set very reasonable based on the cost and the time of restoration. Take a look at our other vintage and post vintage MX bike auctions! Through our contacts in the transportation industry we can offer incredible wholesale shipping rates to your door anywhere in the US – feel free to inquire for more details! Do not let geographical location get in the way of your dream ride!! Shipping is at the buyer’s expense. Most bikes can be shipped between $150-400 within the 48 US depending on your location. International bidders are welcome!! We have some of the most attractive international rates! We are now also offering shipping to Australia – Japan – Switzerland – Italy – Greece – South Africa – Canada – United Kingdom and more!! Inquire for a crated – insured – to your door quote!! Again – please confirm these arrangements up front and be comfortable before bidding!